EXCELSA The new technology allows HP to provide the proper nourishment to replenish the major components of the hair : water, proteins, lipids. - Restructuring intense maximum protection and favor a better penetration of the color. Hydrolysed proteins of the fruit of Bertholletia Excelsa, through a delicate process of enzymatic hydrolysis, are obtained Oligopeptides of very small molecular size able to better penetrate into the hair fiber and to bind strongly to proteins of the hair, facilitating their restructuring and making significant benefits. - Deep moisturizing and long lasting. The oligopeptides once penetrated through the cuticle into the cortex, have the ability to retain water inside the hair, allowing a long-lasting and intense hydration. - Long-lasting color and 100% gray coverage. The interaction between oligopeptides moisturizing and high quality pigments allows you to get rich, vibrant colors, with an optimal degree of coverage (100% of gray hair). 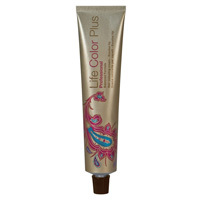 The balanced formula ensures stable colors, avoids discoloration and keeps the color bright longer.